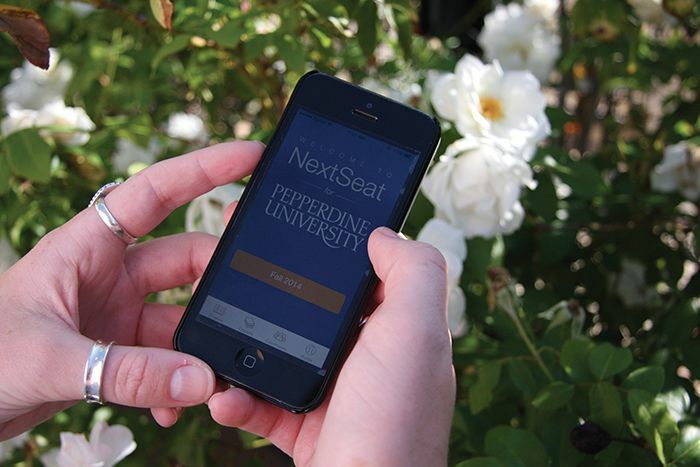 A new iPhone application called NextSeat is now available to Pepperdine and California Lutheran University students. The app, which was first released in August, acts as a study tool to help students connect with peers in their classes with whom they might not otherwise interact. Students can download the free app and create a profile using their Pepperdine email address. The app will recognize the Pepperdine email and automatically provide a list of courses currently being offered at Pepperdine. After students select their courses, NextSeat shows a list of classmates and allows students to post class notes and create study groups within that class. According to senior Evan Dean, student promoter for the app, NextSeat has several academic and social benefits. By making the student collaboration process easier and more efficient, Dean said the app aims to help improve grades. On a social level, NextSeat is supposed to boost student interaction. “It’s kind of a way to connect classmates that won’t necessarily meet each other throughout the semester,” he said. Senior Drew Hacker downloaded the app last week and said he sees great potential, especially in the note-sharing feature. He also said the app may be especially useful as an outlet for academic collaboration. According to Blackman, he and co-founder Adam Zell came up with the idea for the app in a brainstorming session about ways to increase recruiting efficiency. Currently, NextSeat is in the feedback and testing stages and is currently only offered to students at Pepperdine and California Lutheran University for testing purposes. Dean is presently in the process of promoting the app through posters and classroom presentations, beginning with his International Finance and Quantitative Analysis classes. “My goal is in these next coming weeks to eventually start doing presentations at several more classes,” he said. NextSeat is also running a promotion that enters Pepperdine students who download the app and add their classes into a drawing for an Amazon Kindle, which will take place in December before the end of the semester. Blackman also said he hopes to make the app available to other campuses by next semester, and that a version for Android phones is in the works, though there is not yet a timeline for that project.